Speaking of Faith has an interview with Anchee Min, who talks about the brain washing of the Chinese people under Mao. You can listen to it by clicking on the link you find on this page. This past monday was the 40th day after the death of Lance-Corporal Dimitrios Gavriel, who was a well educated and successful Wall Street broker, who gave it all up to serve his country. 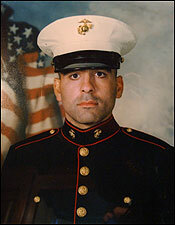 He was killed in fighting in Fallujah, after he had previously been wounded, and could have honorably left the field. He was profoundly affected by September 11th, and knew some of those who died on that day. He was in many ways the Wall Street Pat Tillman, but unfortunately he has gotten a lot less press. Please pray for his repose, and keep his memory alive. We should honor such sacrifice and dedication, and I for one intend to remind people from time to time of this particular example. Now is the best time to maximize your contributions, as all donationswill be matched dollar for dollar by the Order of St Ignatius ofAntioch up to $3,000. For a limited time, request a free booklet onthe Chinese Martyrs sent to you or a designated recipient. You can sponsor a specific day for the good health or in memory ofloved one, for a names day, wedding anniversary, day of repose, or anyother special occasion, which will be noted on the bottom of eachentry of the prologue, and those reading the daily devotion for thatday can pray for your loved ones. Email Nelson Mitrophan Chin at mitrophan@orthodox.cn for availability of a requested day. Many people ask us why the Russian Orthodox Church celebrates Christmas on January 7th. These same people may also have wondered why the Soviet Union celebrated the “October Revolution” on November 7th, and the answers to both questions are related. At the time the communists seized power in Russia, Russia still used the Julian calendar, so named for Julius Caesar, who established it as the official calendar of the Roman Empire. This was the calendar used throughout the Christian world until Pope Gregory XIII introduced a revised calendar in 1582, to address an error in the Julian calendar. The Julian calendar assumes that the solar year is 365.25 days, and so normally a year is 365 days, but every fourth year (called the leap year) an extra day is added to the month of February, and the year is 366 days. The problem is that the actual solar year is 11 minutes shy of being precisely 365.25 days, which does not seem like much, but about every 128 years, this results in a day’s difference. When Pope Gregory XIII introduced the Gregorian calendar, the difference between the two calendars was 10 days. Since that time, the difference has increased to 13 days. Roman Catholic countries adopted the Gregorian calendar immediately, but Protestant and Orthodox Christian Countries did not adopt it for some time. In fact, when George Washington was born, the British Empire was still using the Julian calendar. Britain finally made the change in 1752. However, Orthodox Countries continued to use the Julian calendar until the 20th century. It was only after the Communists seized power, that Russia adopted the Gregorian calendar as its civil Calendar. But since the October Revolution happened before this change, a revolution that occurred on October 25th on the Julian calendar was celebrated by the Soviets on November 7th on the Gregorian calendar. Likewise, though the Russian Church celebrates Christmas on December 25th on the Julian calendar, this happens to fall on January 7th on the Gregorian calendar. There was an attempt by the Soviet government to force the Russian Orthodox Church to accept the “New” calendar, but this attempt failed. The adherence to the “Old” Calendar became a powerful symbol of resistance to the Communist goal of eradicating the Church, as a well as a resistance to other negative trends in the 20th Century (such as attempts to “modernize” Church tradition and doctrine). As a result, the Russian Church has continued to use the Julian calendar to this day, as do the Orthodox Churches of the Ukraine, Serbia, the Georgian Republic, the Holy Land, Jordan, Sinai, and Mount Athos. Several local Orthodox Churches did change to the New Calendar, including the Churches of Greece, Romania, and Bulgaria. This has resulted in the unfortunate problem of having Orthodox Christians celebrating feasts, such as Christmas, on different days, and this is a problem that may take some time for the Orthodox Church as whole to resolve. Hopefully there will be some agreement before the difference between the two calendars increases from 13 days to 14. These Churches (along with the rest of the Orthodox Church) continue to use the Julian Calendar’s Paschalion for the purposes of determining the date of Easter (Pascha), which is why Orthodox Easter is usually at least a week after that of the Gregorian Calendar, and can be as much as a month later (as it will be this coming year).